I've been making (and selling) faux snowballs and snowblocks for a few years. It all started when I had an idea for a project that included a galvanized pail that I had painted. I wanted to fill it with snowballs and under-lighting. Well, it has "snowballed" from there. These are what I decked my Christmas tree with this year. I wanted to show you my frosty ornaments before they head back into storage. She is my pleasant distraction. I've got a sneaking suspicion it's time for my medicine. P-L-E-A-S-E! NOT the yucky stuff!! Wait a minute, whats this? I must give this the sniff test. This is too good to be medicine. It tastes like my yummy favorite...YOGURT. Your Angel is beautiful...they are such good friends and companions. You fooled me on the Icy snow ornaments..thought it was icy snow for real. They are beautiful. What a gorgeous cat! Loved seeing her and your cute ornaments, too. They're cute! Might have to try making some for myself! Liked the yawning cat picture. The snowballs look so real! And Angel is beautiful. I have two of my own and there are days I wonder what I would be like without them. OMG, she is soooooooooooo beautiful! Do you give her pills, or is it liquid stuff? If it's pills, but Greenies Pill Pockets. They've been a lifesaver for me with Simmie! I actually buy the dog ones (Chicken) because they're huge and each one I can break off pieces and use it at least 5 times! Now, I really want to know how you made those pretty snow balls!!! Sara, Those snowballs are way too cool! I don't remember seeing then in your shop last time I was there. I am interested in them - can you get back with me about them? Thanks, schweetie. That is a clever way to feed a cat her meds. Awesome snow ornaments! I thought they were real. WOW!The snowballs are incredibly life like. A cat that likes yogurt,Would you believe our hens love it! Wow , the snowballs are wonderful! Sweet kitty, too! Enjoy your week! what a sweet kitty!!! i love your snow ornaments...i thought that was real snow at first too!!! Hi Sara! Thank you for visiting my blog! I LOVE your snow ornaments! I wonder if my kitty would eat yogurt? How adorable! Off to enjoy more of your blog! I love the snowball --oranments?? could have fooled me. very neat. Your blog is really beautiful and you are a very creative person. I like your snowball ornaments and your Angel is so cute. Your snow ornaments are just wonderful! I love them! LOve your kitty! LOL! I can't believe she likes yogurt! What a beautiful cat - great photos. Those snowballs look so realistic! Oh my goodness, how beautiful your Angel is (except in that one scary photo ;) Your ornaments are very cute Sara! Have a great day and thank you for putting my giveaway on your sidebar, I've dropped your name in the hat once again! Beautiful icy snow ornaments Sara! Angel is such a gorgeous girl! I wish I could hold her and she could meet my Mr Chestnut. I am so glad to hear she is doing better these days. Thank you God. Amen. Shhh...don't tell but Chestnut is on a diet as well. He! Our kitties do love to eat huh? Thank you for your kind words about our guest room. You made my day sweet friend! Your beautiful white cat is soooo beautiful.I've always loved white cats. Yours certainly an Angel. I Just love your snowball ornaments... they are just gorgeous.Do you make a sell them? So kool looking. Speaking of Snowballs.One of my white peacocks is name Snowball.I also had a white cat years ago ...named Snowball. since I have a new baby white peacock(unnamed as of now)I think I will call it Angel after your cat. Those snowballs are really neat Sara! I bet your tree was gorgeous! I've been taking down decorations today, boo hoo...no fun. Still have my tree up though...will wait a few more days. Thank you so much for stopping by my blog! I'm so glad to have a new "friend" who is almost a neighbor. Your blog and the things you make are lovely - so is your precious kitty. I love your ornaments. They look so real! Oh the snowballs looked so real. I had the same idea. How did you do it? BTW your kitty is so sweet. Thanks for visiting with me and the bunnies. We enjoyed our visit with you too and will be back for sure! Love those snowballs and of course love the kitty! Have always had a love of white cats! All of this white? Quite nice I must say! We had an all white cat for 18 years, named appropriately Snowball. He was deaf but a wonderful companion to my DD throughout her childhood. She even had a wedding picture taken with him! Thanks for stopping by & adding your well wishes for my friends & the poor people of Haiti. I really like your snowball ornaments, I bet they look beautiful on your tree. Have a pic of the whole tree? I will stop feeling guilty now about posting about my pet instead of baskets :) lovely lovely blog Sara; enjoying it very much!! I thought I would stop over and tell you that I did have craft therapy today and it was wonderful. Nothing like creating something fun to make you feel so much better....your kitty sure looks like she is enjoying whatever meds she needs...maybe I should try that! Both your treasures are very beautiful. Your snow ornaments are very unique and lovely. I'll try to make it back Tuesday. Oh, I love your photographs especially the icy ones! Very beautiful. 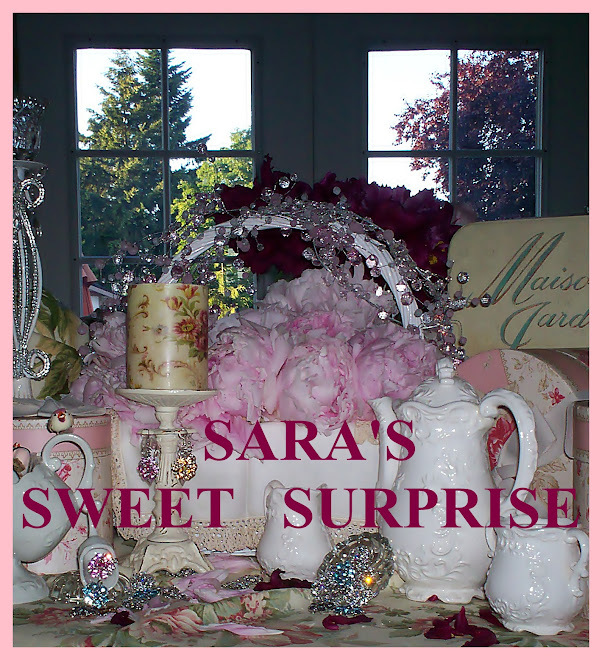 sarasweetsurprise.blogspot.com; You saved my day again. Oh my gosh - this looks just like my grandson (8) taking his medicine - but at the end where your gorgeous cat takes his medicine - my grandson is still fighting - lol.